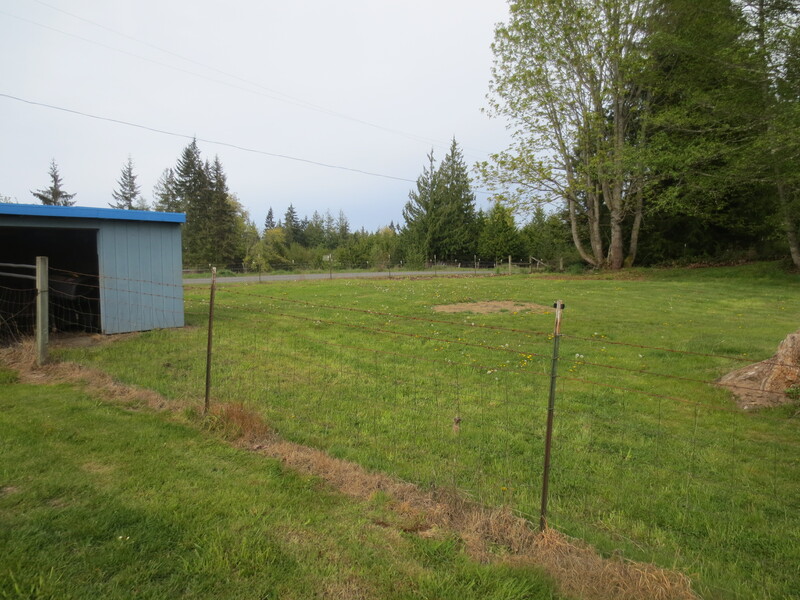 Settling in time at the ‘farm’ – we certainly have lots of work to do to make our little farm really “ours” but slowly we will make it just as we want. First big project was to create a parking space for our travel trailer which would have the feel of being part of the family yard for visitors. And, as our new little farmhouse has only one bedroom, we need guest facilities. 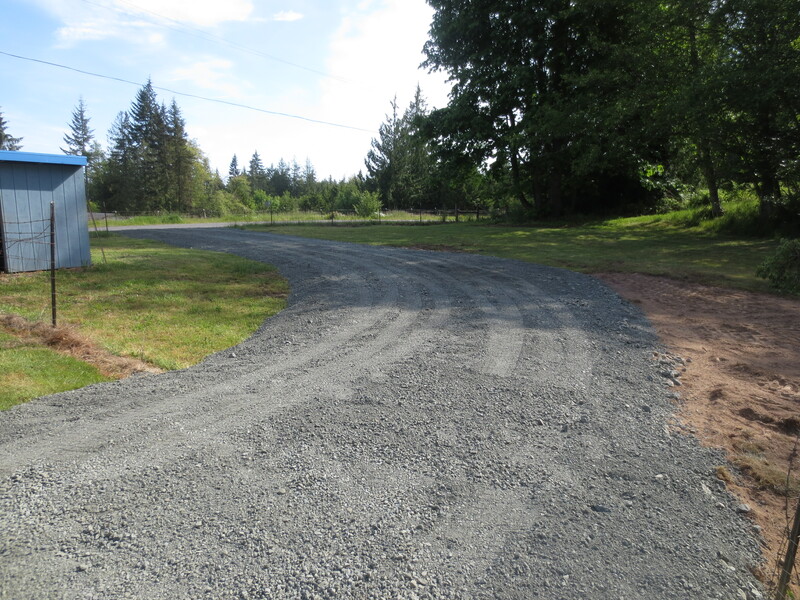 The new driveway is turning out exactly as we had visualized and we’re almost ready to bring the trailer to its new home. Back in the kitchen, it’s been an adventure learning to work in the much smaller kitchen than our old house, but thankfully after spending 10 months on the road in the smallest of small kitchens, this new one is looking kind of large right now! All the boxes are still not unpacked as yet, so it’s a challenge to work around what I don’t have accessible! 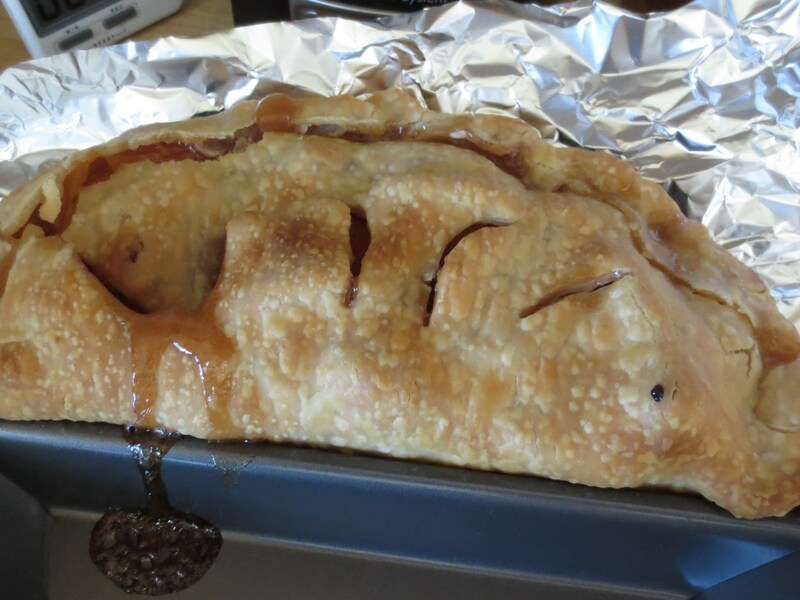 For this next treat what I miss the most is my half pie tin which allows us to enjoy pies, but not have a whole one in the house to over-tempt us. If your house has only 2 people, this might be an idea for all of us who love pie! 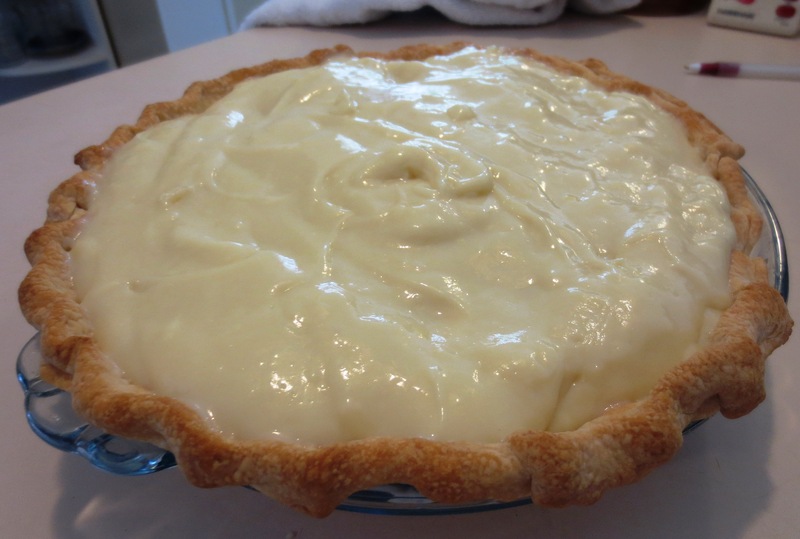 But, since it was still packed, sigh…I had over-ripe bananas which needed to be used and HAD to make a large banana pie and boy, did we eat it all with no problem at all, except a little guilt thrown in. It’s been years since I’ve made this pie and my old recipe stands up well and is delicious. In 2-quart saucepan, mix sugar, cornstarch and salt. Stir in milk until smooth. Cook over medium heat, stirring constantly, until mixture boils and thickens; boil and stir 2 minutes. Remove from heat. Stir about 1/4 cup hot mixture into egg yolks. Gradually stir yolk mixture into hot mixture. Cook over medium heat, stirring constantly, just until mixture begins to bubble and is thickened. Remove from heat; stir in butter and vanilla. Cool until lukewarm, about 20 minutes. Arrange banana slices in cooled baked shell. Pour cooled pudding over bananas. Refrigerate until set, at least 3 hours. Store in refrigerator. Here is a recipe for roasted veggies which can take you through a complete day of enjoying healthy meals, well at least 2 of your meals while busy going through boxes. I made just 1/2 the original recipe, but now I wish I had made an entire amount, it’s that good. I found myself picking at the peppers until I just had to hide them in the refrigerator to stay out of them. The original recipe came from o old Weight Watchers magazine. 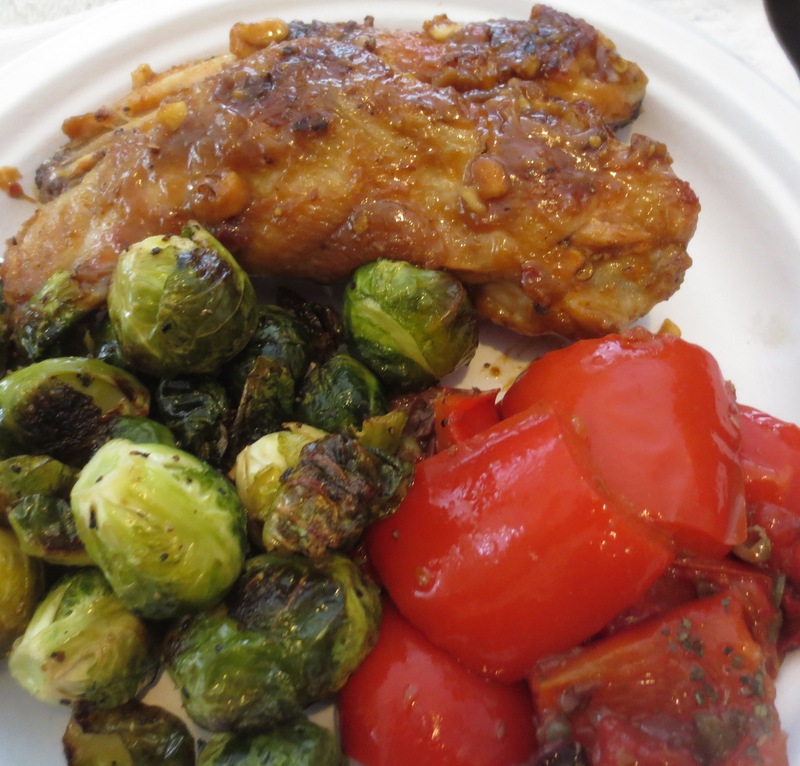 I started the day roasting the peppers and trying to stay out of them until I could serve them with our grilled chicken wings and Brussels sprouts. Preheat oven 350° F. Spray a large rimmed b. sheet with nonstick spray. 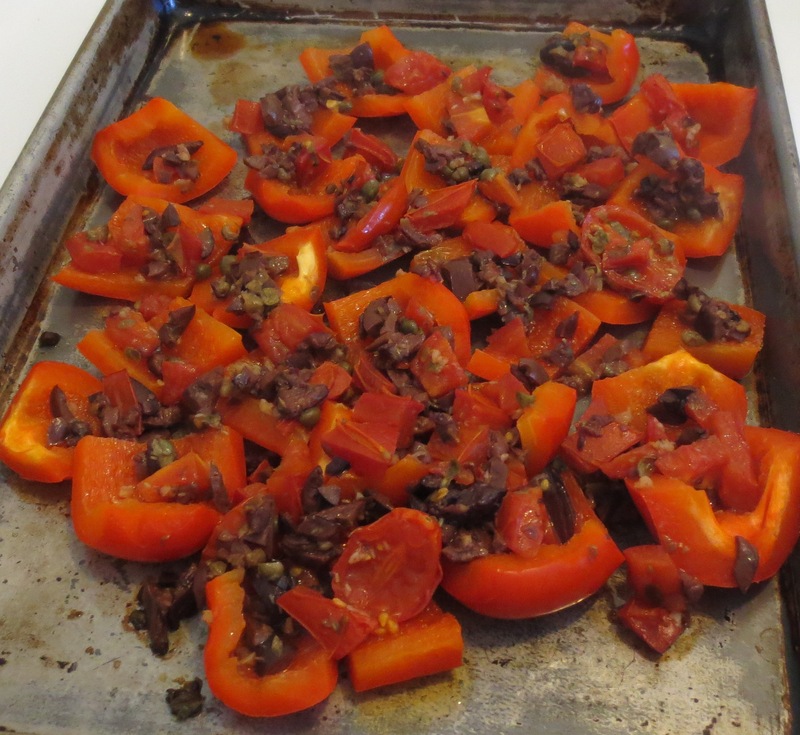 Mix the tomatoes, olives, capers, garlic, red pepper flakes, and 1 tsp. oil in a bowl. Spread the bell peppers, skin side down, on the baking sheet. Spoon the tomato mixture over them. Cover loosely with foil and roast 30 minutes. Uncover and roast until the peppers are tender, about 15 minutes. (NOTE: When I removed from oven to uncover, my peppers were just al dente – to me perfect, so didn’t do the additional 15 min.) Let the pepper mixture cool. Transfer to an airtight container & refrigerate up to 2 days. Transfer the salad to a bowl and let come to room temp., about 1 hour. Whisk the remaining 2 tsp. oil, the vinegar, and salt in a small bow. Drizzle over the salad and sprinkle with the basil. 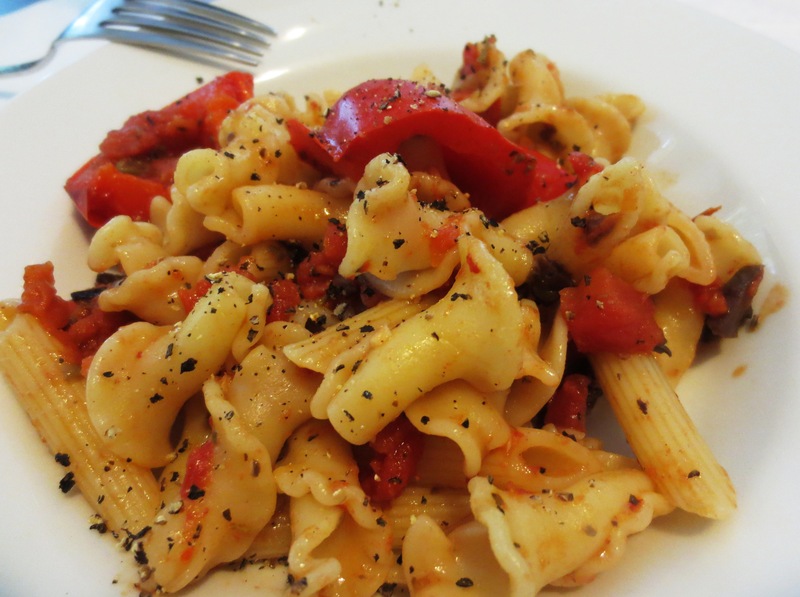 And for our later snack/supper, I tossed the other half (really a quarter of the original recipe) the roasted peppers with 1/3 cup marinara sauce I had in the freezer and tossed with hot pasta. Delicious. Such an easy day of healthy eating. P.S. 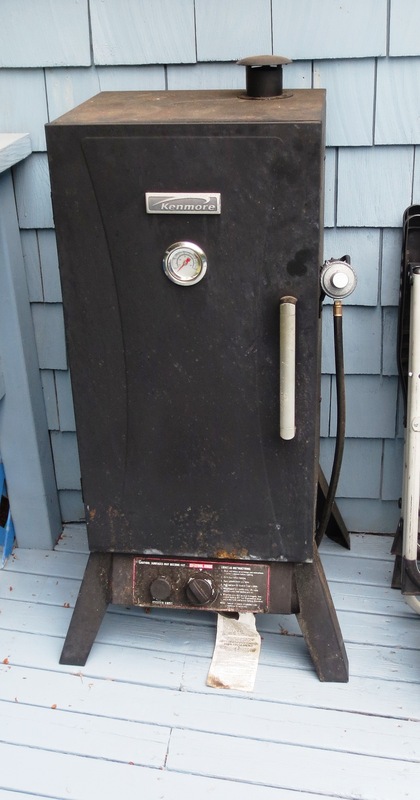 And, look what Farmer Roy just brought home to me…..my smoker!! What a happy cook I will be now that I can pick up a pork belly and get busy smoking some bacon for the family. Yum! And, with Memorial Day coming up, I can smoke some ribs!! Have a wonderful holiday, everyone and let’s all remember those who gave so much for us in the Armed Forces – God Bless them all.